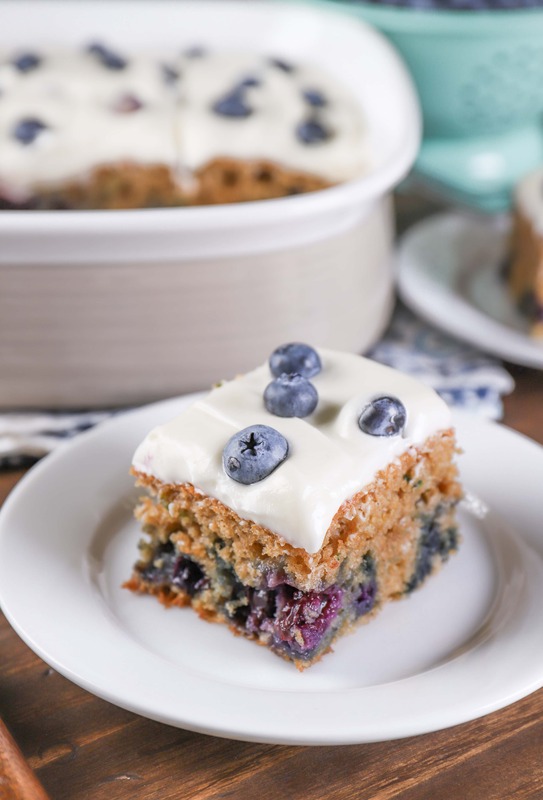 This Blueberry Zucchini Snack Cake is made with yogurt and whole wheat flour, but you’d never guess it from how tender and flavorful it is! 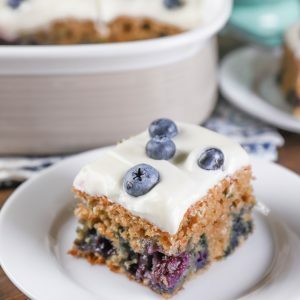 Put your abundant zucchini and fresh summer blueberries to good use and make this easy zucchini snack cake! Our zucchini plants are going crazy. Every year we think that we should probably plant fewer seeds, and every year we still end up with tons of zucchini! This year is obviously no different. And while I love grilling it up to go with whatever meat is on the grill for the evening, or making zoodles with it, I can’t resist baking with it. It’s so easy to sneak it into baked goods to add moisture without adding flavor. Zucchini breads and zucchini cakes have already made appearances on the blog, and this one bowl chocolate zucchini snack cake is one of my favorites. However, most of the recipes have chocolate in them. There is this zucchini carrot cake bread that my husband loves, but no recipes with fruit. And I happened to have blueberries that needed to be used before they went bad. 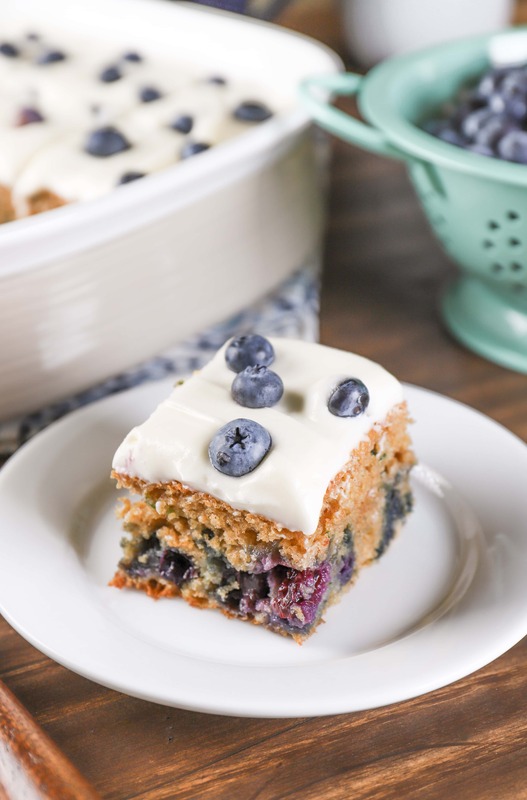 It wasn’t long before blueberry zucchini snack cake was coming out of the oven! The base of this cake is the one bowl chocolate chip zucchini cake. 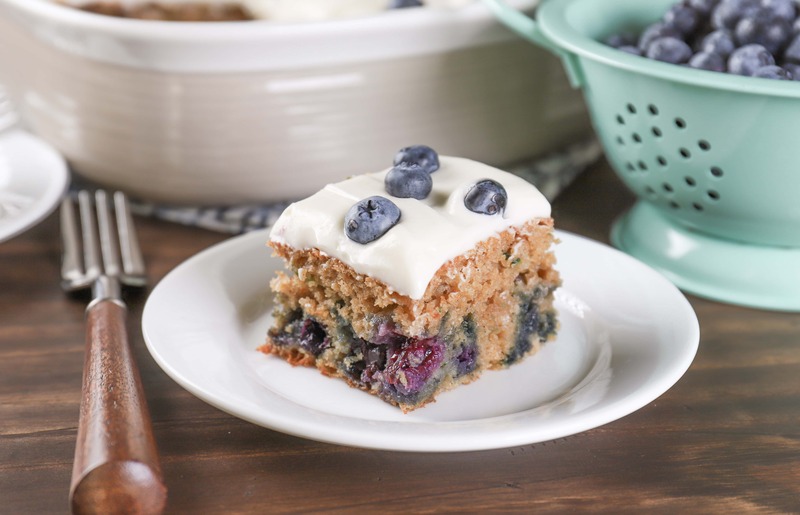 Swapping out the mini chocolate for blueberries and adding a hint of cinnamon gives this cake a fresh, summer flavor. Of course, I couldn’t resist making a sweet, creamy cream cheese frosting at the last minute to top it off. Cream cheese frosting is usually a good answer to a lot of baked goods. Zucchini cake is no different! 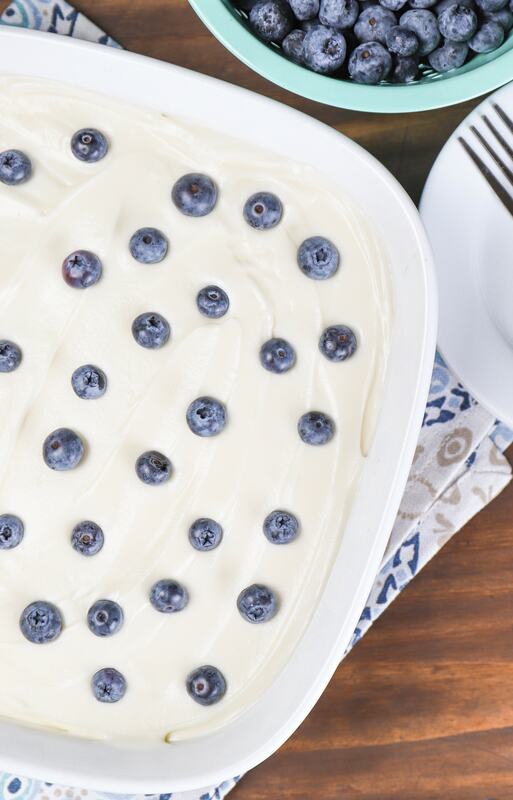 The sweet, tangy cream cheese frosting complements the sweet blueberries perfectly. Top it off with a sprinkling of fresh blueberries and serve! Add in flour, cinnamon, baking soda, and salt. Stir together until just combined. Stir in shredded zucchini and blueberries. Spread batter into prepared baking dish. Bake for 25-30 minutes, or until toothpick inserted in the center comes out clean. Remove to a wire rack to cool. Beat together cream cheese and butter until combined. Slowly beat in confectioner's sugar and salt until creamy. Spread cream cheese frosting over cooled cake. Top with additional blueberries, if desired. Serve.